Current Status: in Grand Lodge Vault; merged with Henry Price Lodge to form Price-Benton Lodge, 11/21/2002; now part of The Consolidated Lodge. By Worshipful Albert A. Lappin. On behalf of the officers and members of Everett C. Benton Lodge, I welcome you to this, our twenty-fifth anniversary celebration. We are happy that you came to join with us to properly mark our silver anniversary year, and hope that the evening will prove an enjoyable one to you and linger in your memories for many years to come. An occasion such as this naturally calls for the recitation of the background and history of Everett C. Benton Lodge, and that duty falls upon me. On June 10, 1925, eighty-four out of eighty-seven charter members assembled in Masonic Temple, East Boston, and by order of Most Worshipful Dudley H. Ferrell, were instituted into a Lodge by Right Worshipful Gorham W. Walker, District Deputy Grand Master for the Chelsea Third Masonic District. There and at that time, we are pleased to believe, was born a Masonic organization which was destined to take its place in the shining light of Masonry according to the highest ideals and traditions of the order. On that memorable evening, the eighty-four charter members, by unanimous consent, elected to take the name of Everett C. Benton for their Lodge, to honor and perpetuate the memory of a man and a Mason who served as Grand Master of Masons in Massachusetts in 1912 and 1913, and who so endeared himself to the entire fraternity by his unselfish devotion to the craft, that it was thought not only would his name be honored by this choice, but also that the Lodge would be honored by having the privilege of bearing his illustrious name. During the first year, while under dispensation, Worshipful James D. Robertson became our first presiding Master, and a line of officers were carefully chosen who were later to reflect glory to the Lodge. Convinced of the reliability, trustworthiness and seriousness of purpose of the officers of Everett C. Benton Lodge, Most Worshipful Frank L. Simpson, Grand Master of Masons in Massachusetts, and a suite of distinguished officers constituted Everett C. Benton Lodge on April 20, 1926; gave us their blessing; and we were now ready to perform the duties and functions and assume the obligations and place in the community of a Masonic Lodge. How well we have accomplished our mission, history has recorded during the quarter of a century just passed; and our accomplishments speak for themselves. The mere fact that this, or any other organization, has existed for twenty-live years is not, in itself, an event of great importance and one that is worthy of a particular commemoration or celebration such as this glorious gathering, but the achievements, the goals attained, the good done to Brethren and others, the help to a community, the service to God and Country, the help to the sick, the destitute, the widow and the orphan — it is these facts, this work, these achievements, that are worthy of remembering and commemorating after a quarter of a century of existence. Loyal to the ideals and ideas of Masonry, Everett C. Benton Lodge has, during the past two and a half decades, taken its place in the ranks of Masonic Lodges in Massachusetts. Our records will indicate that we have helped our less fortunate Brethren; assisted tne widows and orphans of departed Brethren; visited with the sick; cheered the unhappy and sympathized with their misfortunes. Our work has not been confined to Masons and families of Masons. We have truly taken our place in the community in a list of endeavors too numerous to mention, but of at we are particularly proud — our annual childrens' party when we entertain over five hundred underprivileged children with a show and party; present them with literally heaps of gifts; and are more than amply rewarded for our efforts by the sight of the happiness and sunshine on the faces of blind, crippled, poor and underprivileged children. These are events worthy to remember and commemorate. The pages of Everett C. Benton Lodge history contain the names of Wor. James D. Robertson, Wor. Louis Papp, Wor. Ernest B. Shallenbach, Wor. Jerome D. Bauer, who have been called to the Celestial Lodge above by the Supreme Architect of the Universe. We hold their memories dear and are not unmindful of their service to our beloved Lodge. My friends, there stands Everett C. Benton Lodge history — the living, pulsating, and yet working history of Everett C. Benton Lodge. There stand men, representatives of every walk of life, professional and business, who gave of their time and strength, of their health and of their efforts for Everett C. Benton Lodge. The sight of these men standing before me speaks more eloquently than any words of mine of the standards of Everett C. Benton Lodge. They, with Wor. Arthur Wolfe and R.W. Josiah H. Benton, who are not here this evening, are the living examples from whom we, of the present, and you in whose hands the future destinies of Everett C. Benton Lodge will be held, take inspiration and example, and in our attempts to emulate, and yes, even surpass the accomplishments of the past, our Lodge and Masonry as a whole shall rise to greater and greater heights. May it be the will of the Almighty to bless and prosper all our future endeavors for good. By Worshipful Franklin E. Kartun. Everett C. Benton Lodge is celebrating its 50th year. The members all rejoice in the attainment of this milestone in our history. We know that special events and celebrations are being planned by the Presiding Master, Worshipful C. Philip Wilson and his officers for this significant year. The real meaning of the Golden Anniversary of a Lodge, more especially Everett C. Benton Lodge, is more profound. It involves much, but the basic premise is how this organization has affected the lives of those who have shared the unique experience. While it is indeed fitting and proper for a history of fifty years to be written it is also motivated by feelings of warmth and accomplishment. One enjoys "happy reflections" of scenes and events, pleasures and even sorrows. Most of all, however, we use this occasion to remember the brethren who are, after all, the Lodge's most important and valuable asset. They make up the very fabric of the Lodge and observance of a 50th Anniversary is really a celebration of the efforts of the hundreds of men who have been a part of it for half a century. Therefore, instead of a re-creation of the rather dry chronological events, which appear in the records meticulously kept by a succession of the finest, most dedicated secretaries any Lodge could have, your Historian has elected to relate this history more in terms of people than events. This year is the Bicentennial of the United States of America. We cannot help but know it. All around us we see and hear the evidence of the 200th Anniversary of the birth of our nation. It is altogether fitting that Everett C. Benton Lodge's 50th year coincides with the Bicentennial. The Masonic participation and overtones of our glorious revolution are too well known to bear repeating here. Suffice to say that the American Revolution was a very Masonic event and the whole idea of the hope and promise of this, our beloved America, are wholly in harmony and in keeping with the highest ideals and basic philosophy of Freemasonry. Everett C. Benton Lodge rejoices in our nation's celebration and takes great pride that its own important anniversary comes at the same time. Back in 1924-1925 a need was felt for a new Masonic Lodge. The Lodges in the area had more demands for membership upon them than they could fill. Therefore, a group of Masons determined to form a new Lodge to be located in East Boston. The group of founders was mostly from East Boston, Chelsea and Winthrop, but many areas around Greater Boston were represented. Several other outstanding Lodges of the time and area contributed heavily to our Charter roles, most particularly Shawmut Lodge. A great Mason, Everett C. Benton, had recently passed away. He had been an important leader in many fields, not just in Boston, but throughout New England and the entire United States. He had served Masonry in many capacities, honorably and well, most auspiciously as Most Worshipful Grand Master of Masons in Massachusetts from 1912 to 1913. Brother Jay R. Benton, the son of this great man, was then serving as Attorney General of the Commonwealth of Massachusetts and a committee waited upon him and requested that he endorse the use of his father's name for the Lodge and that he also be a Charter Member. Thus, on June 10, 1925, eighty-four of the eighty-seven Charter Members assembled and as the result of the granting of a dispensation by order of Most Worshipful Dudley H. Ferrell, were instituted into a Lodge. The honor was conferred by Right Worshipful Gorham W. Walker, District Deputy Grand Master for the Chelsea Third Masonic District. On that memorable evening the name of Everett C. Benton was unanimously selected to be the name of this Lodge and a commitment was made, not only to honor the man, but that the Lodge bearing his name would be so honored that it must always live by the ideals and devotion to the Fraternity exemplified by him. During the first year, while under dispensation, Worshipful James D. Robertson, a physician from Brookline, was our first Presiding Master. A line of officers was carefully chosen. That care resulted not only in glory and distinction to the Lodge but set a pattern of excellence followed through these years. Impressed by the reliability and adherence to Masonic tradition of the Officers of Everett C. Benton Lodge, Most Worshipful Frank L. Simpson, Grand Master of Masons in Massachusetts, along with a suite of distinguished Officers, constituted Everett C. Benton Lodge a Masonic Lodge on April 20, 1926. (1926 Mass. 115-128) On that evening over three hundred Masons were in attendance and all were in formal dress. This added to the dignity of the ceremony of constitution and was a unique experience for all. Most of our Charter Members are gone now, though some few are still with us. It is an imposing group, taking in many areas of Masonic life. Brethren like Brother Philip Bauer of Germania Lodge and Brother Abraham Papp of Shawmut Lodge gave us a firm foundation in how to do things the Masonic way. The guidance and friendship of Right Worshipful Edward C.R. Bagley of Baalbec Lodge was invaluable. The Grand Master appointed as the first Master, Worshipful James D. Robertson. The Senior Warden was Worshipful Louis Papp and the Junior Warden, Brother Ernest B. Schallenbach. Treasurer of the Lodge was Brother Jacob C. Morse. Brother Leo J. Lyons, who was instrumental in founding the Lodge, had been previously appointed Financial Secretary. Brother William S. Watts was appointed Secretary. Our first Chaplain was Reverend Brother Kenneth L. Danskin, Unitarian minister who acted as such until October 19, 1926 when he was transferred from this area. Brother Everett F. Matthews was our Tyler, one of the finest examples of a Mason. When the Membership Committee first met, the number of applications was so great it took weeks just to have the applicants appear before the committee. Indeed, the early Masters of the Lodge were forced to restrict the number of candidates and at times no further applications could be considered. The meetings were thronged and a spirit of friendship and brotherly love was established which has always been the hallmark of Everett C. Benton Lodge. From the beginning Everett C. Benton Lodge established close and warm relationships with the sister Lodges in the area. There were frequent visitations and exchanges of degree teams. It was interesting and stimulating and contributed much to fellowship. There was almost always entertainment at those early meetings. For many years it was necessary to have special meetings almost every month to conduct the Degree work on the applicants. Often the brethren themselves would prepare and serve the meals on these occasions. This carried on for many years until we left East Boston and brethren such as Worshipful Henry Rosnosky, Brother Alexander Blinder and Worshipful Albert A. Lappin, along with many others, worked hard and long hours to please their brethren with tasty meals. The Seiler dinners during the regular meetings were memorable and the nostalgia they engendered is still remembered with fondness bv the older members. Worshipful Louis Papp succeeded our first Master. He was taken from us shortly after his term as Master and in his will he left us the beginning of a fund, named after him, which now pays the dues of members who are unable to do so themselves. His name will always be remembered in this Lodge, along with his brother and Worshipful Ira Daniels, a member of the Papp family, a Past Master of Shawmut Lodge and pillar of strength for so many years to Everett C. Benton Lodge. Doc. Schallenbach's term as Master brought tragedy. After only a few months he suddenly died. Another of our funds bears his name. He was succeeded by one of our most interesting people, Worshipful Oliver C. Elliot, who for years ran a rescue mission for homeless men in Boston's South End. He was an unusual man, big and handsome and exuded confidence and strength. We were fortunate to have him. Brother Charles Ross was the next Master. Though he distinguished himself in that office, his real contribution was as our Secretary until his death. His love for Everett C. Benton Lodge knew no bounds and he worked hard and long. His smiling face graces the Secretary's desk in the memories of many of us. Following Charlie Ross came Worshipful Lewis Goldberg, who was appointed to the bench of the Superior Court of the Commonwealth during his term. For years his ritual was the epitome of perfection. We remember his dignity and expression. It is not our intention to mention each and every Master in this chronicle. It is the spirit of friendship and devotion to high Masonic ideals that we must remember. It is the leadership of a Lodge that gives this to the brethren. Our Senior Past Master, Worshipful Frank Fruendlich, served in the early period. Shortly after his term he was appointed Junior Grand Steward by the Grand Master. We must again mention the service of Worshipful Henry Rosnosky, not so much for his fine administration as Master but for all he did in taking care of the printing and mailing for the Lodge for so many years. Brother Bernard "Ben" Fritz, who was associated with Brother Henry for many years, also should have a special mention here. They worked hard and contributed much to their beloved Lodge. In our fifty years, Everett C. Benton Lodge has had thirty Masters of which 18 are now living. From this illustrious group, three have been honored by a Grand Master with appointment as District Deputy Grand Master for the Chelsea Third Masonic District. The first was Right Worshipful Josiah H. Benton, son of Everett C. Benton. Right Worshipful Joe was raised in our Lodge on a glittering occasion, served as Master and subsequently was appointed District Deputy. 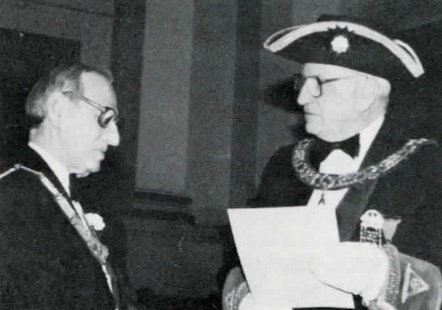 The second was our most distinguished Right Worshipful Harry J. Borofsky, Brother Harry was raised in one of the first classes of the Lodge and has been an integral part of it ever since. After serving as Master, he became Treasurer on September 18, 1945, and has held that post since. His devoted service to Masonry was recognized by the Grand Master on three occasions. First by his appointment as District Deputy; second, by his being awarded the Joseph Warren Medal and finally, by his appointment as Grand Representative of the Grand Lodge of Brazilia near our Grand Lodge. He still serves us well and we hope he does for many years to come. The third appointment as District Deputy was that of Right Worshipful Sidney Schlager. Right Worshipful Sidney is the nephew of Right Worshipful Borofsky and Worshipful David W. Burrows. We must mention another member of the Borofsky family who will always be remembered in this Lodge, Brother James Burrows, who for many years handled the difficult job as Dinner Chairman. He is no longer with us in person but certainly in spirit. Shortly after World War II, with Worshipful Samuel Stern presiding, the Lodge had the most elaborate celebration ever. Social events had been suspended during the war and the resumption of activities by us was done in grand style. The war years, including World War II and the Korean Conflict, brought change and sorrow to our brethren. During the years of the great World Conflict in particular, Masonry tried to bring solace and comfort to those brethren serving, the families of brethren away, and those at home who became bereaved. Everett C. Henton Lodge kept in contact with all in our family who served away from home and the officers and members brought as much consolation as they could to those whose loved ones made the supreme sacrifice or were severely wounded. While the number of candidates diminished during the war years, the return of the veterans gave Freemasonry everywhere a new impetus. Candidates applied in greater numbers than any time since the organization of the Lodge. The Lodge Hall was filled with enthusiastic members. The experiences of the battlefield had made men desirous of the benefits of Freemasonry. For many years, indeed since its founding, the brethren of Everett C. Benton Lodge have had a special place in their hearts for the sick and handicapped and especially for children. We have held many events for them. Underprivileged children have been given parties. Father and sons nights were often held in the East Boston Lodge Hall and became famous. Our most famous party is one held each year in June. 'I'his is our Worshipful Selig Simons Sunshine Party. Our late Worshipful Simons instituted this function for the physically handicapped during his term from 1952 to 1954. The joy on the faces of those who cannot go out for an evening's entertainment, but who must rely on such occasions as ours, is our reward. It is a wonderful event and draws favorable comment and contributions from many brethren of other Lodges as well as our own. Worshipful Louis Abelman has served as Chairman of this Party for many years and deserves much of the credit for the success of this great event. Assisting him is Brother Morris Cohen, who with Brother Frank Gainsboro are co-Chairmen of our Entertainment Committee. On May 1, 1952, Everett C. Benton Lodge made a great change. We moved, under the leadership of Worshinful Charles H. Milender, from the Masonic Temple in East Boston to our present location in the Grand Lodge Temple in Boston. The old building needed much in the way of repair and, alas, is no longer serving Freemasonry. It will be remembered with affection by all those who took their degrees there. The modern era of the Lodge dates from our move. We have kept up the reputation for excellent work and strict adherence to the tenets of Freemasonry. The site of our labors has changed but the ideals remain the same. We cannot, as previously stated, mention everyone. Some stand out in the mind, however. Worshipful Albert A. Lappin was Master during our 25th year. A great celebration was held at the Statler Hotel in Boston, an evening that has been warmly remembered. Our second Tyler for so many years faithfully outside the door was Brother Albert B. Goldman. No one who ever met him will forget him. Brother Richard M. Levine, our Marshal for many years, was another of our stalwarts. He was the epitome of a Marshal of a Masonic Lodge; tall, military and dignified. Brother Samuel Goldman, D.D., our Chaplain, with his wit and ability to pray at the altar so beautifully, reflected a fine religious training and a finer man. Reverend Brother Benjamin H. Rodwogin and Brother Benjamin 1. Sargon followed in that fine tradition as Chaplains. Our organist, Brother Harry E. Rodgers, a man without parallel in his field who made the Lodge bright with harmony. Brother Averill Rosenberg, who for so long has been a devoted worker in the area of Masonic service. Brother Frank G. Lichtenstein succeeded Worshipful Charles Ross in 1956 as a peerless Secretary and acted as such for 18 years. Happily for us he is followed in that position by his son, Worshipful Brother Mark. Brother Charles Gale served as Treasurer for a period. So many unsung workers and Brothers, the loyal members who sat on the sidelines, so many they cannot possibly all be mentioned. A few who are gone come to mind: Brother Eddie Krims, Brother Harvey Kartun, Brother Jack Shuman, Brother Alex Blinder, Brother Aaron Kipnes, Brother Maurice Harvey, Brother Morris Schneider and many, many more. Worshipful Myer Lesberg, William Fagell, Milton Saxe, David I. Sargon and Milton A. Carlan have all been tireless workers in seeing to it that the traditions of the Lodge are maintained. Worshipful Irving Rubin was privileged to have raised his son, Worshipful Brother Theodore and also to have subsequently installed him as Master. Everett C. Benton Lodge has been singularly honored by Grand Lodge by having three of its living brethren hold the coveted Joseph Warren Medal for Distinguished Service. They are Right Worshipful Harry J. Borofsky, Worshipful Louis Abelman, and Brother Averill Rosenberg. They bring credit and distinction to Everett C. Benton Lodge by their work and devotion. On our 50th Anniversary, we salute them. Presently, we have Brother Moses Wernick in the Masonic Home at Charlton. He has been there now since 1966. We are proud that this great work of Grand Lodge can help one of our members. Our Lodge has on several occasions contributed to the Masonic Home and Hospital. We have tried to be as good Masons as a Lodge as we are individually. In addition, we have established the Everett C. Benton Lodge Philanthropic Fund administered for many years by Brother Phillip Lemelman as Trustee and now assisted by Brother Eliot H. Blinder. While not strictly a Lodge Fund, it has done much. It is the purpose of this Fund to make gifts of needed physical equipment, usually medical in nature, to hospitals, institutions and organizations in our area. Our brethren have been generous and follow the teachings of Masonic charity. We strive for the perfect Masonic ideals. We will not reach them, but the important thing is we try. Everett C. Benton Lodge has had a glorious past. It will have an equally glorious future. But most of all, this Lodge has and will live in the hearts of its brethren and for this we can only thank the Supreme Architect. May Everett C. Benton Lodge prosper and may its name forever be a blessing. History of Everett C. Benton Lodge, 1925-2000. "Time, you old gypsy man, will you not stay, put up your caravan just for one day?" With those famous and familiar lines the late British poet, Ralph Hodgson, dutifully recognized the inexorable passage of time. It seems to me that it was only last week that I penned our fiftieth anniversary history, and now I am writing for 75 years. When we look at Everett C. Benton Lodge we find much has changed over the past 25 years. Although we have fewer members we are still a viable Masonic Lodge. Times have changed and everyone is affected. The Grand Lodge is doing a great deal to combat these problems as are all in the great Fraternity. With fewer candidates, the work tends to suffer, though Everett C. Benton Lodge has striven to keep up the old standards. We still have a good number of remarkable men who make a difference. We have been fortunate in our receipt of Grand Lodge honors. Two of our Past Masters have been appointed District Deputy Grand Master for the Chelsea Third Masonic District. First, M. W. Stanley Maxwell appointed R. W. Charles Philip Wilson to the post in which he served with great distinction for two years, and now M. W. Fred K. Bauer has appointed R. W. Gary C. Miller who is currently in office. Five Joseph Warren Medals for distinguished service have been awarded to Wor. Franklin E. Kartun, R. W. Mark Lichtenstein, R. W. Gary C. Miller, the late Wor. David I. Sargon, and R. W. C. Philip Wilson. Our secretary, Mark Lichtenstein, is both a Grand Representative to the Grand Lodge of Brazilia and was for many years the Judge Advocate of the Board of Trial Commissioners of the Grand Lodge. We have had to recycle our Masters. R.W. Gary Miller served for three years rather than the usual two. Wor. Milton Saxe was asked to resume the East for a year many years after his term. He served well but left with his wife for retirement to Florida. The most difficult and daunting task fell to me. In 19861 was requested to again assume the East for one or two years and I ended up spending twelve consecutive years. We now have our present Master in Wor. Henry Shulman, and we wish him much success. There have been so many workers and friends over the years. Wor. Louis Abelman and Bro. Averill Rosenberg were both taken from us at far too young an age. Their field was service and relief and both were rewarded with Joseph Warren Medals. We fortunately were blessed with the Sargon brothers. Bro. Ben served as our Chaplain for 31 years and Wor. David was a great stalwart of the Lodge. He served as Officer, Master, consultant, and friend. These men came from Bombay, India. They brought us the wisdom of the East with a great fraternal love. Wor. Rabbi Benjamin H. Rodwogin, a distinguished Chelsea cleric, did a wonderful job as Master as well as serving a term as Grand Chaplain. Wors. Henry E. Weiss and Michael R. Hugo were devoted and hard working Masters who spent considerable time on Lodge affairs. We have been fortunate in having long-standing Officers. R. W. Harry J. Borofsky served 49 years and his successor R.W. Gary C. Miller was appointed in 1993. Our unparalleled Secretary, R.W. Mark Lichtenstein, has been in office for 25 years, succeeding his father Bro. Frank at the same job. We are especially proud of our Philanthropic Fund under the direction of Bro. Neil J. Schwartz. We have always believed strongly in Masonic charity. At each monthly meeting, we give grants of money to various charitable organizations. They are of all types, Masonic or non-Masonic, secular or religious, and the like. A representative of each group is requested to come to our meeting and tell us about the organization. In June, we grant a scholarship to a metropolitan high school senior. Also, each June we hold our well known Wor. Selig Simons-Wor. Louis Abelman Sunshine Party. We entertain, feed, and assist a large group afflicted with many ailments. We hope to keep it going for years to come. Bros. Louis Abelman and Morris Cohen who are gone and Bros. Joel A. Seskin, Peter Bloom, Daniel Goldstein and Cyril Kruss deserve much credit for all their fine hard work on this affair. We must not forget Bro. Philip Bloom, who spends much time on arranging for the monthly notice mailings. Brothers Peter Bloom and Dan Goldstein keep a liaison open with our widows by sending Jewish New Year cards each year. So we are alive and well. We hope to continue to do so. Heraclitus, the Greek philosopher, said, "There is nothing permanent except change." We will have change, but we shall persevere. Everett C. Benton Lodge of Boston held a Testimonial Dinner to honor one of their most cherished Brothers when the Grand Master paid a visit to present him with a Letter of Commendation and to extol his virtues both in and out of the Craft. R. W. Harry Joseph Borofsky was born January 17, 1899, and petitioned the Lodge in 1925. Raised a Master Mason on February 10, 1926, he entered a two-year line of Officers and eventually became Master, serving during the years 1943-1945. He had no sooner retired as Master when he was elected and installed Treasurer on Sept. 18,1945, a position he still fills with honor and pride. M. W. Whitfield W. Johnson appointed him District Deputy Grand Master of the Chelsea Third Masonic District for the years 1954-1955, and succeeding District Deputies still hold up visiting suites knowing the impressive record of R.W. "Harry" for attendance. Ninety-nine percent of the time he will appear and be introduced. A fine turnout of members of the Craft and friends was on hand in Boston to add their acclaim to a great Mason. The picture shows the Grand Master as he presented R. W. Bro. Borofsky the Grand Lodge letter. R. W. Bro. Borofsky is a holder of the prestigious Joseph Warren Distinguished Service Medal of the Grand Lodge. Grand Master M. W. [http://masonicgenealogy.com/MediaWiki/index.php?title=GMBauer Fred K. Bauer} presented five Fifty Year Veterans Medals as part of the celebration in April. Brothers Paul M. Stone. Gerald Stepner. Sheldon B. Bershad, Joel A. Seskin, R. W. Gary C. Miller, D. D. G. M., Chelsea 3rd District, and M. W. Fred K. Bauer. This page was last modified on 5 June 2018, at 12:40.